From here, atop a concrete tower in the Brea Hills, I have a commanding view of Southern California. Behind me, I can see, faintly, the top of the monumental skyscrapers of downtown Los Angeles. On the right is the majestic deep blue of the Pacific. In front of me are Disneyland, Angel Stadium, and the rest of Orange County. I discovered this place when I was in junior high school six years ago. 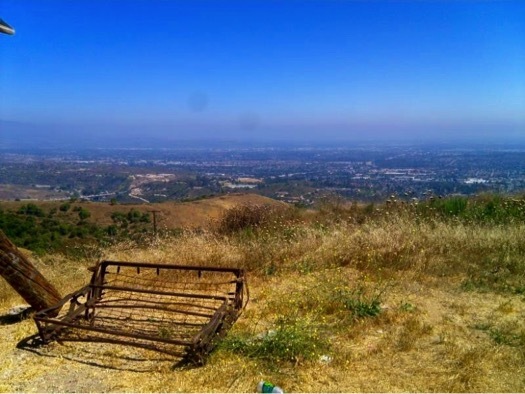 Four of my closest friends and I were exploring in the wilderness behind one of our houses in Brea after his mom told us we needed some fresh air. Once outside, we saw an enormous hill and decided to find out what was at its summit. We made our way through some bushes and followed a dirt trail uphill for about 15 minutes. We stumbled upon a small building that resembled a guard booth at a parking garage. Then, some 30 feet or so beyond, we came upon a water tower, a separate radar tower with a red light, and two freestanding pillars that appeared to be claws reaching out of the ground. About a football field’s distance away was a staircase that led to nowhere. In 1958 a nuclear warhead capable of destroying a large chunk of California was housed a few hundred feet away from the buildings and pillars we had stumbled upon. We learned that in 1958 a nuclear warhead capable of destroying a large chunk of California was housed a few hundred feet away from the buildings and pillars we had stumbled upon. During the Cold War, when schoolchildren practiced “duck and cover” drills, the government built 16 missile sites in the L.A. area that made up one of the so-called “Rings of Supersonic Steel.” The government feared an aerial threat from our enemies and installed bases armed with anti-aircraft missiles around populated coastal cities vulnerable to an attack. Each base had approximately 120 soldiers with machine guns and a handful of vicious guard dogs—along with Nike Ajax and Hercules missiles. In 1971, LA-29 was officially deactivated, as the Army cut back on missile defense systems and talks were underway with the Soviet Union to reduce missile stocks. By 2000, all the L.A. Nike sites had been demolished. Today, LA-29 is an oil field that also hosts cattle and commercial beehives. Where the missile silos used to be are just paved concrete lots. Nobody talked much about these missile sites back when they were operational. My dad, who grew up in Orange County in the 1960s, heard rumors of something related to World War II back there in the hills, but he did not find those rumors credible. My mother had no clue there was a missile base five minutes from our house, and we never discussed such a thing when I was growing up. After I told my mother about LA-29, she was not very supportive of me going back. But I had to. This was the place I went to when I had to get away from the stress of school, when I wanted to be alone and read a book, when I wanted to watch the clouds, when I wanted to think things through, when I wanted to listen to nothing but the birds and the wind. I still go today when I can. It’s easier now that I have a car. But the trip requires climbing up through a drainage tunnel that goes underneath the street because a fence now cuts off the foot trail. Every now and then I kick a beer bottle that echoes throughout the passageway, and I can hear my breath amplified as if it’s going through a loudspeaker. As I step out of the tunnel, I find myself in a trench inside the premises. The dusty dirt path to the top takes another 15 minutes, as I hike by rusty oil equipment including an unmoving “cricket,” or a pumpjack. There is no place I would rather be than here, at the top of a concrete pillar, on a nearly forgotten missile defense base. It might be strange to say this because I know I’m at a place that could have participated in World War III, but here’s where I find a feeling of peace. Tyler Spicer is a freshman business administration major at Chapman University. *Photo courtesy of Tyler Spicer. Cold War, exploration, military, Orange County, Thinking, Thinking L.A.